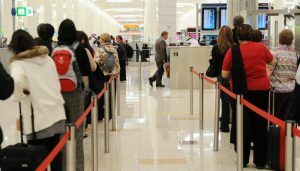 Dubai authorities have launched a new system that will enable travelers at the city’s international airport to use their smart phone in lieu of their passports to get on flights. The system is called Emirates Smart Wallet and aims to further streamline travel movement across Dubai International Airport, UAE news agency WAM reported. The scheme was launched Wednesday at the airport’s departure terminal and is at its first phase. The smart phone contains traveler’s personal data, Emirates ID and passport information as well as the e-gate card data. The ultimate goal is to cut back travel clearing procedures to the minimum, WAM reports. Written by: KanelkaTagba on June 8, 2017. Posted by KanelkaTagba on Jun 8 2017. Filed under Gulf News, Headlines. You can follow any responses to this entry through the RSS 2.0. Both comments and pings are currently closed.